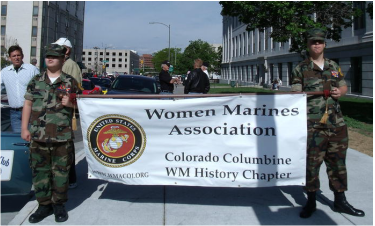 For more information on the Colorado Columbine - WM History Chapter of the women Marines, please contact any of the board members listed below. If you need assistance, know of a veteran who does or if you'd like to help veterans or help educate others about women Marines please contact us @ WMACO1@comcast.net. If you have any historical information or memorabilia on women Marines please contact National WMA at ​WMA@WomenMarines.org as they are now the owners of the history collection "Women of the Corps" which was founded by WMA CO1 in 2005 and given to National WMA in 2011. WMA is always looking for items to add to the Women of the Corps Collection.